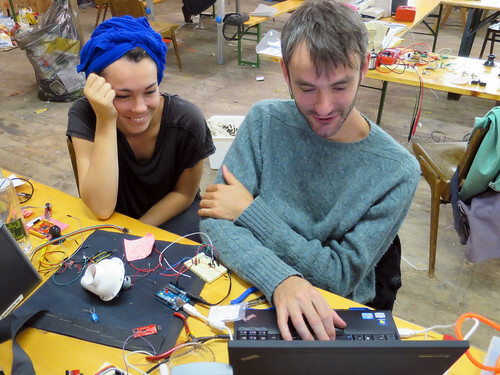 The aim of this 10-day joint project is to bring together e-textile practitioners with performing artists to build interactive wearables and textiles that can be performed in a live context. 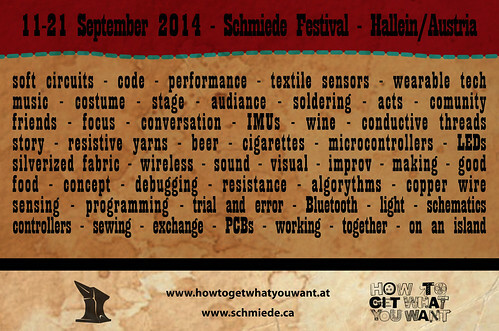 The project will take place as part of the Schmiede festival which happens every September in Hallein, Austria. The Schmiede has been going for over 10 years, and is set in an old salt factory on the outskirts of Salzburg. Over 100 artists, performers and media makers gather here every year to collaborate and make work together. 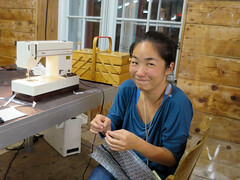 The atmosphere is relaxed but hard working, and open for all kinds of experimentation. The location is inspiring and a real retreat from daily distractions. An ideal setting for our project! 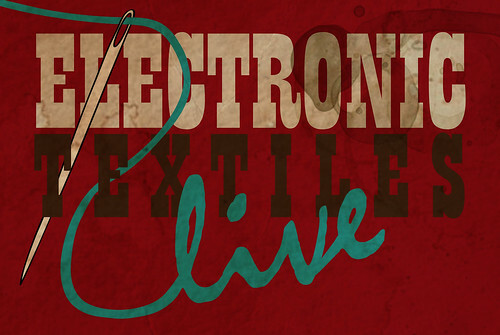 The E-Textiles Live Project/Lab is open for anybody to join, but we are especially keen to bring together those of you already involved in working with: electronics, interactive media, e-textiles/soft circuits, costume design and performing arts (music, performance, dance…). 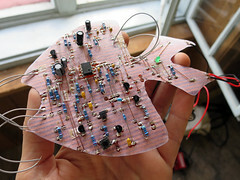 The project will provide us with space, time, materials and tools to develop concepts, collaborate and work on ideas that involve electronic textiles in “Live” and “On Stage” performance settings. 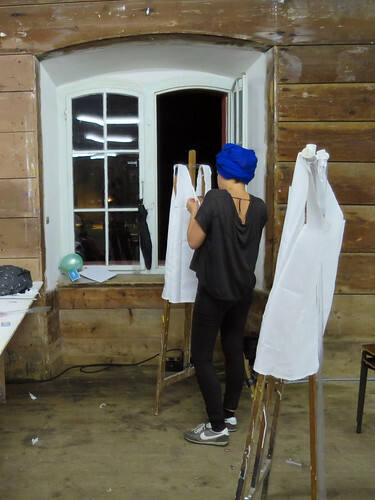 The outcome of the project will be performed at a public event on the last day of the Schmiede festival. 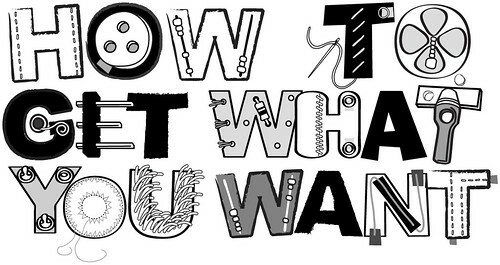 The call for Schmiede 2014 is closed, but if you are interested in future iterations, please sign up for our HTGWYW newsletter! 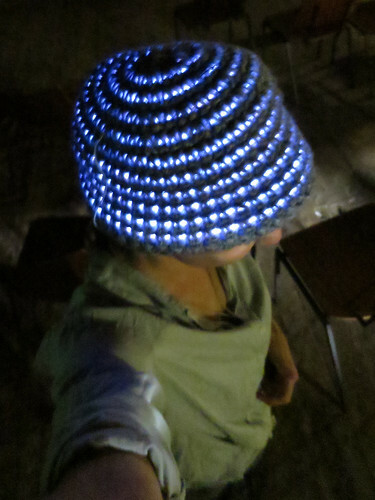 A matrix bade from conductive fabric rows and columns fused to a base fabric with Eeonyx piezoresistive fabric inbetween. The rows and columns are connected to a Teensy microcontroller which parses the rows and columns to measure pressure and location on the surface of the fabric matrix. 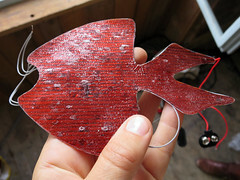 Sensor data is read into a PD patch that synthesizes sound. 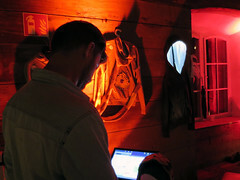 MOON is a fiber-optic hoodie that reacts to the DJ set of the performer, illuminating the “moon” to beat of the music. 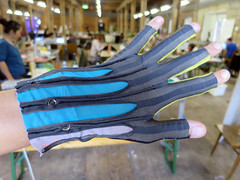 A new e-textile version of the Mi.Mu glove which is based on a conductive striped zebra fabric produced by HiTek coated in piezoresistive carbon polymer by Eeonyx. Continuing working with Austrian Lederhosen leather to make a series of regional soundtrack synthesizers. 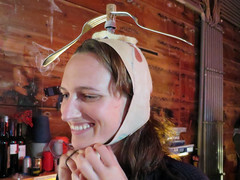 This leather hat has a weighted propeller made from two heavy metal forks stuck in a wine bottle cork and mounted on a potentiometer that is mounted on top of a joystick (two potentiometers). The potentiometers capture the movements of turn and tilt in all directions and these values are wirelessly sent to a Processing sketch running on a computer. The processing sketch translates movement into sound. SpaceTime Helix is a kinetic light and sound sculpture, showing the passage of time, endlessly into the future. 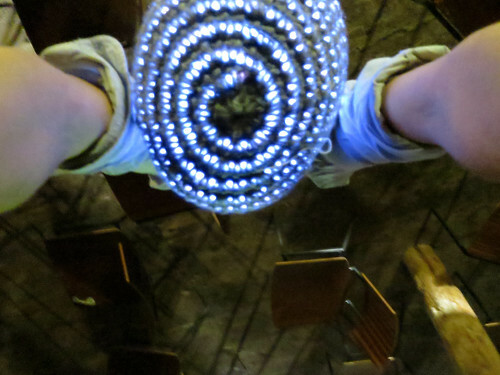 It is a play with light, helical symmetries, geometry and infinity. Embroidery patterns have always been associated with symbols that decorate everyday life and create narratives of the world that surrounds us. This project proposes the construction of a capacitive sensing wearable with four embroidered sensors and attempts a “naive” representation of the Chronology of the Universe according to the Big Bang Expansion, through the creation and sonification of four of its different phases: the birth of sub-atomic particles, the creation of matter, the formation of galaxies and planets and the actual metric expansion of the known universe. 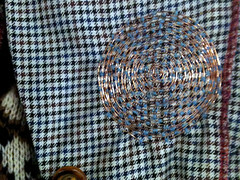 The copper thread sensors trigger an interactive soundscape of chaotic and stochastic sound generators. 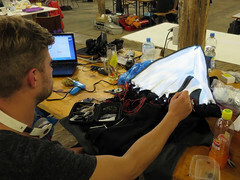 Capacitive Sensing Jacket demo @Schmiede Festival from Afroditi Stereo on Vimeo. 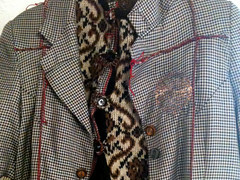 Speakers embroidered onto a jacket. A dance- video art performance based on Antigone’s monologue before she goes to the cave-grave to be burried alive. Deadline for application is May 30th 2014! 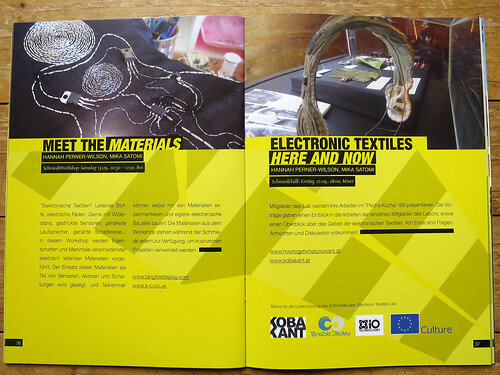 In the application form, in reply to the question “Will you bring a project to Schmiede?” please reference the “E-Textiles Live Project/Lab”. Food: optional 50 Euro for amazingly good food prepared by Asian Dub Kitchen for the full duration of the workshop (breakfast and lunch). Getting There and Accommodation: please check your Schmiede acceptance email and the Schmiede Facebook page! 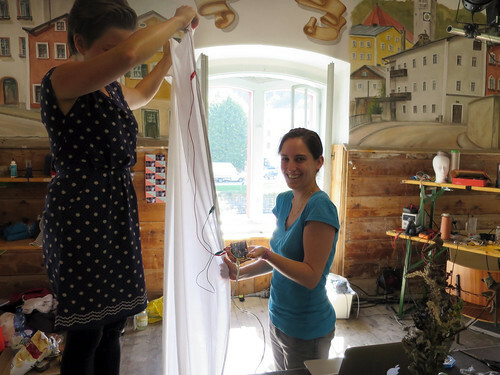 Leitende Stoffe, Elektrische Fäden, Garne mit Wiederstand, Gestrickte Sensoren, Gehäkelte Lautsprecher, Genähte Schaltkreise…. In diesem Workshop werden Eigenschaften und Merkmale verschiedenster elektrisch leitende Materielien vorgeführt. 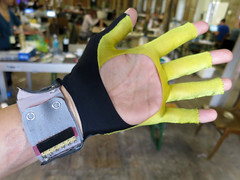 Der Einsatz dieser Materialien als Teil von Sensoren, Aktoren und Schaltungen wird gezeigt, und Teilnehmer können selbst mit den Materialien experimentieren und eigene Elektronische Bauteile bauen! Die Materialien aus den Workshop stehen während der Schmiede jedem zur Verfügung um in einzelnen Projekten verwendet werden. Cheese and Wine and …. 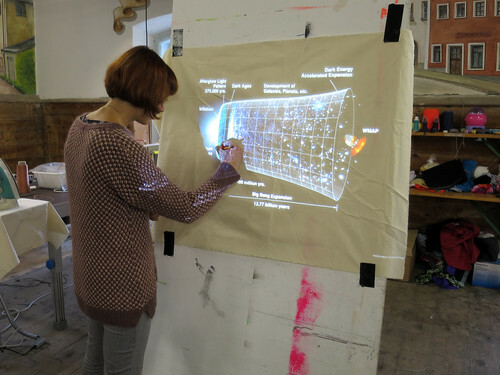 Schmiede – playground of ideas from Judith Holzer on Vimeo. Let me know news about it, Sounds Great!!! Very interesting. Are dancer welcome? Please let me know when and where it will take place and how to participate. I am very interested! I am currently walking from amsterdam to austria in a three-piece walking suit, 96 days, 1400 km. I’ve got two embroidered QR codes on my suit that link to my blog where I am posting every day through my solar powered iPad. Inbetween walking and writing I embroider drawings and texts on my suit. More here: http://www.asoftarmour5.blogspot.com. I was already planning to apply for Schmiede but wasn’t sure what to do there, how to continue on what I am working on now. Your Lab is the kind of thing I’ve been wanting to do for a long time. 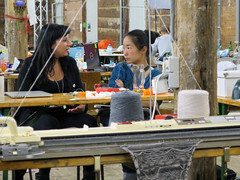 I work with performance, new media, textiles and i am always very keen on exchange and collaboration. hi, your mailbox seems to be full. tried to appy for schmiede. will try again tomorrow!